Well, the one positive thing about this race is that it is now in the past. 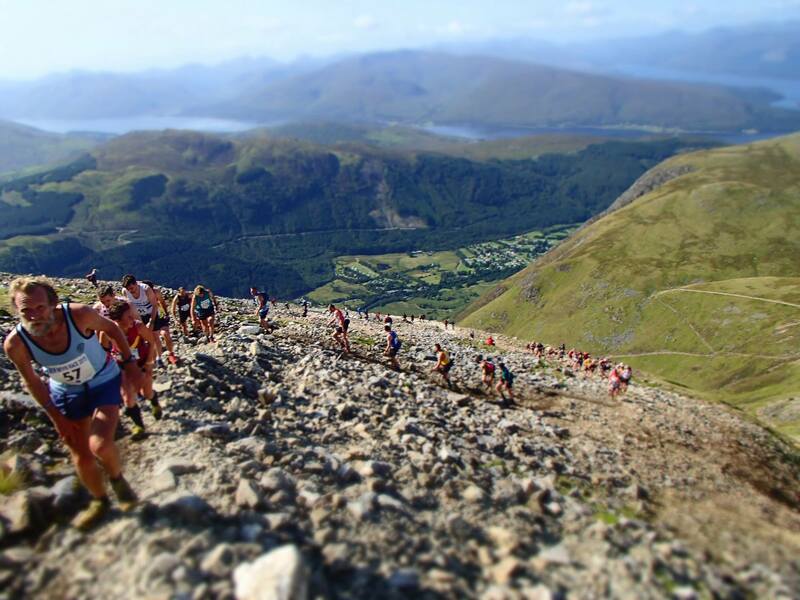 Since I discovered the strange and brutal branch of running that is hill running, the Ben Nevis race is the one everyone has talked about. There are others that get some attention as classics, sure, but none of them get the attention and respect this one does. I was drawn in from the first time I’d heard about it. There are all kinds of stories associated with the race, from how it started, the records, the first lady to run it, the race that never was due to supposed poor weather and those are just the general stories. Each hill running club also seem to have their own personal accounts of the race over the years typically from numerous falls and tumbles, or the after race antics in the town. 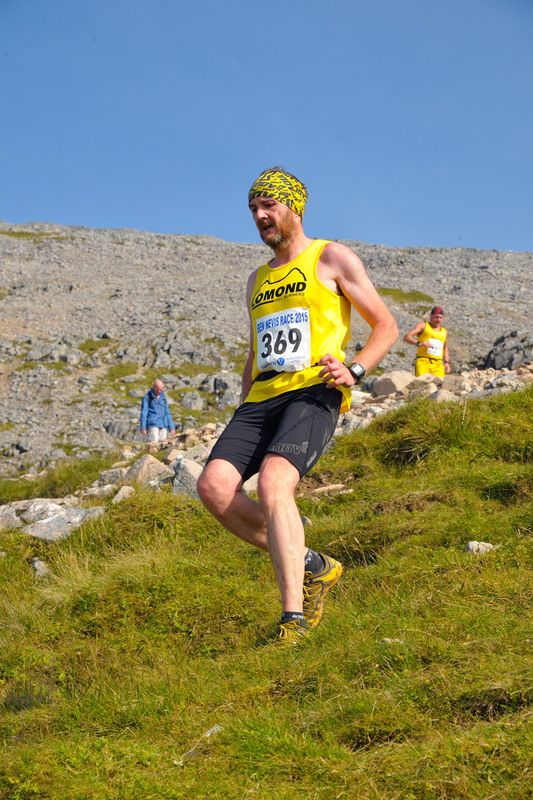 I think it is fair to say that the Ben Nevis race has a very strong history, and this weekend I learned the hard way why that is. 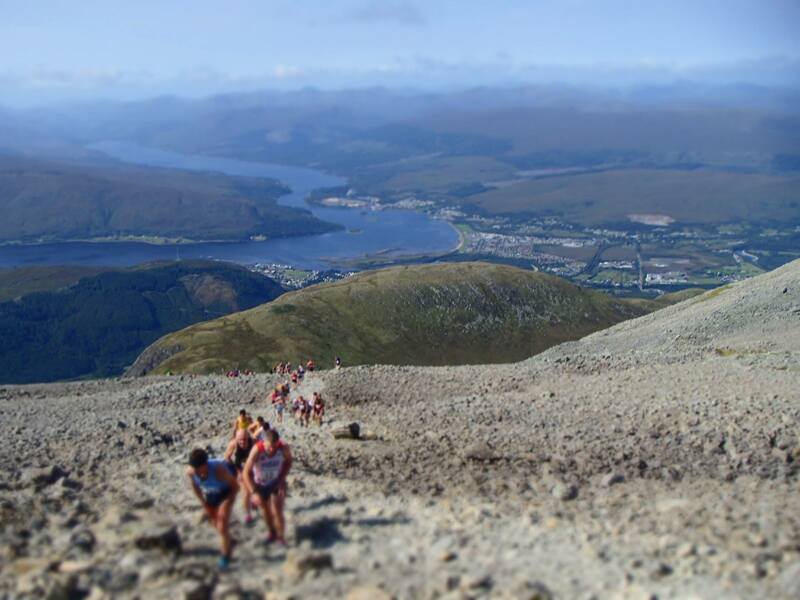 In case you haven’t heard about this race, it is about 14km long and starts at sea level in the town of Fort William and climbs linearly to the summit of the UK’s highest mountain, Ben Nevis at a height of 1344m. It starts in a local playing field then follows a road for about a mile to the start of what is called the Mountain Track, or tourist track as many call it. 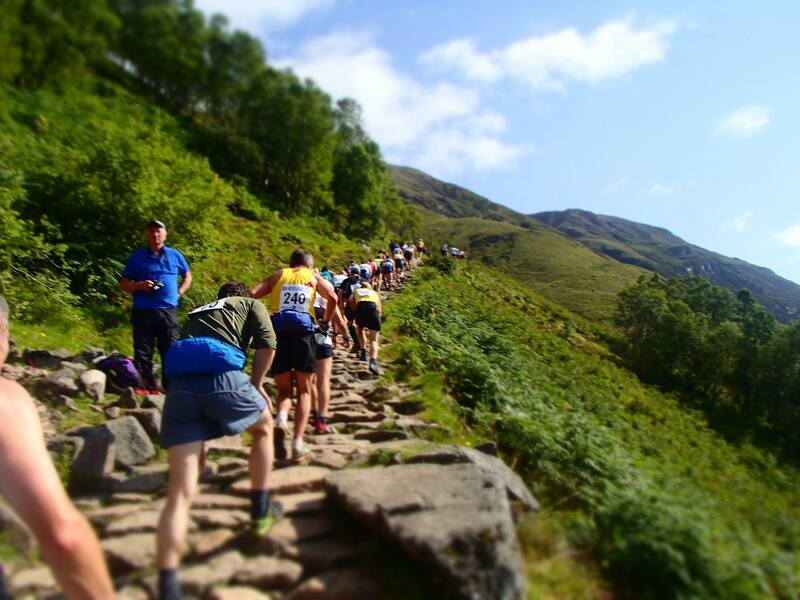 This is a rocky path which lazily winds its way up towards the summit of Ben Nevis. About half way the track takes a wide loop before crossing the Red Burn, which is a natural water course which falls down this side of the mountain. Rather than taking this wide loop, the race breaks from the track at this point and makes a straight line directly to the top. A short while above the red burn the terrain turns into a mix of scree and boulder field. The hill levels out eventually at a summit plateau. Here you hand over a wrist band you were given at the start so the race officials know you have summited, then you reverse the course all the way back down, over the burn, along the tourist track, to the road and finally once last lap of the playing field just for good measure. Two things stood out for me. 1. It is brutally consistent in how steep and tough it is and 2. It is relentless. There are simply no parts of the route where you can slacken off the effort required to keep moving and take a breather like there are in so many other races. Most other hill races in the UK, or abroad for that matter, even those which take in this much elevation in one race, they do so in sections. That means you get a chance to use different muscles to keep moving, you get a chance to slow your breathing and heart rate down. but not the ben. From the moment you leave the flat playing field, the next 7km are guaranteed to be uphill all the way. The road section is a good warm up. I knew the race was going to be tough so whilst I was moving reasonably fast here, I was conscious not to blow myself out before the climbing started for real. The weather on Saturday was also spectacular. It was close to 20 degrees in Fort William, blue skies and barely any wind. A lovely summers day by any other measure, however on the day of a race like this, it added to the ‘fun’ and i felt it straight away on the road. After about a mile the road turns to track and narrows. By now everyone was well strung out and in general, you were now with the people you would spend the rest of the race with. The running turned into the usual power hike almost immediately. There are several little beaten tracks which go off at angles as you head up, some of which cut corners, and some of which are simply alternatives to the main track. Without the benefit of local knowledge, I think most people like me just followed the backside of the person in front of them, assuming they knew where they were going. After what felt like an hour (and turned out to be 20 minutes) I made my first mistake of the run; I looked up. What I saw was a sight I wouldn’t want to wish on anyone and taught me the biggest lesson I learned from the day. By this point the track had turned the corner to head up towards the summit and you could see the long line of runners heading up the hill. It was a very long line and it was a very big hill. The mental impact of this on me, when I was starting to feel tired was immediate and people started to pass me. I knew what was happening and I could feel my will to keep driving my legs falling away, but I couldn’t stop it. The heat was taking a toll, my legs were tired and that hill seemed to stretch away into the sky. Before long I was feeling about as bad as I’ve ever done in any race and I knew I wasn’t event half way yet. We eventually crossed the red burn and I took the opportunity to douse myself in water and grab a few handfuls of water to drink. This perked me up a little bit and I knew from studying the map before the race and my walk up here earlier in the year, that the summit wasn’t much further away. Again, the race route broke away from the tourist track now and made a straight line to the top. Crossing first scree lined slopes, then progressively more boulder and rocky, the only word to describe it was a trudge. Nobody was moving fast here, just putting one foot in front of the other knowing you were near the top. The air was cooler and it was welcome. One of the benefits I suppose of running up such large mountains. Not long after making a start on the scree, Finlay Wild came flying past on his descent. Finlay had won the race for the past 5 years and was always tantalisingly close to breaking the record of 1h 25m set in 1984. He had a huge lead again on Saturday and subsequently went on to set his own record for winning the race 6 times in a row, but was 5 minutes away from beating the record time this year. Seeing the speed at which he was going down woke me up and not long after all the other top flight runners were whizzing past as well. I foolishly thought that meant I was near the top, but sadly, it was probably another 20 minutes before I reached the summit and got to turn around. By the time I got there, mentally I was in a better place, but my legs felt like they were done. The cool air and the views from the summit plateau woke me up and a couple of jelly babies from the fantastic support on the summit also helped. On the way up I’d been paying attention to what we’d been running over and knew it was going to be tough going down too. The flat at the summit gave me a chance to shake out the fatigue from my legs a bit, so as soon as we hit the scree I was feeling a bit more lively. I’d not run much on this stuff, so it was a little new to me, and it turns out I really enjoy it. I quickly felt like I could stretch things out a bit and immediately started to pass people. I’ve noticed this in a few races, as soon as the downhill sections start, I seem to pick up speed quickly and pass a few people. that then gives me confidence and I start to open up more and consequently do generally quite well on down hills. I was enjoying this now, all I wanted to do was get down and I knew I had a long way to go, but this was definitely easier for me than the uphill work. Every time you put your foot down when running down scree, you know it might be the one which trips you up. I saw several people around me go head first after catching a toe and I later saw a lot of people with blood injuries from taking a tumble up there. Despite that, my desire to get down overtook my desire to stay safe. And then I came across the section know as the green wall. The green wall is a steep, grassy bank which goes from the bottom of the scree to the Red Burn. It feels almost vertical when you are running down it, and I imagine on a wet, rainy day it is like a water slide. Despite the hot weather, it was damp underfoot and slippery, but not as bad as I imagine it could have been. I had Inov-8 mudclaws on which grip like crazy in this type of terrain, so felt ok. The lower down the slope you got though, the steeper and more eroded it became. Inevitably I slipped onto my backside and did a bum slide several times. By now, my legs were utterly shambolic. I started to feel cramp on my inner thighs and my quads were useless too. I hit the red burn and all the people I’d passed coming down seemed to pass me again. I took on some water and splashed myself, but the cold did nothing to revive me this time. I set off towards the main track again but my legs had given up. My head wasn’t far behind either and I felt myself stumbling along the track. I must have looked a sorry sight. I knew i had to keep moving though as I was determined to finish. I also know I still had a couple of miles to go, including a mile on the road and that final lap of the field back at the finish. I had a couple of energy gels in my pocket and had these one at a time. Each time they picked me up just enough to let me break into a jog downhill. Stumbling over rocks, past tourists heading down after a day on the hill, and past spectators all cheering everyone on, I made it back to the road. Everyone had commented on how their legs stop on the road, so I’d saved one gel for just before I reached it. I managed to break into a consistent run and knew it was just a few minutes now before this version of hell was over. The field came and I managed to push myself a little as I did the lap to take a few people who were in front of me and claw a few places back. then it was over. Without doubt, this was the hardest I’ve ever had to work. The uphill is a horrible trudge and highlights all the possible areas of weakness in your fitness and physical and mental strength. 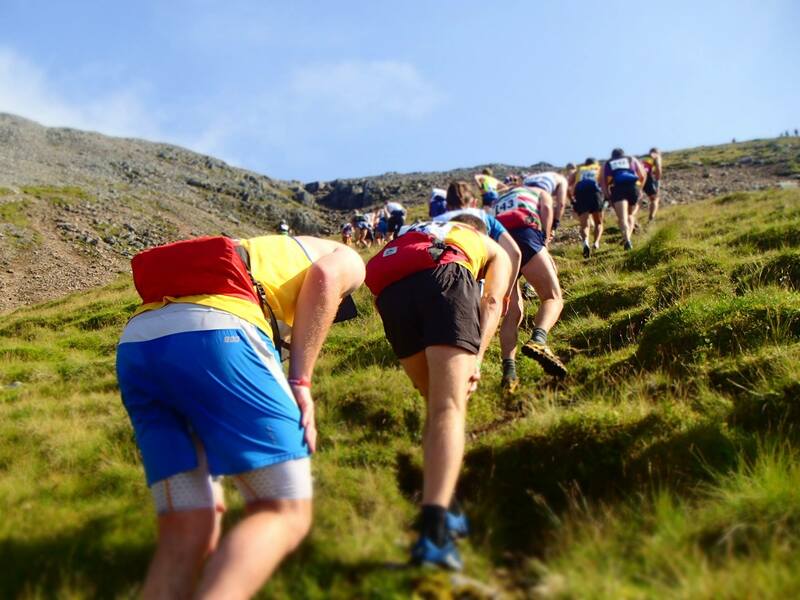 The downhill is brutal, it consists of just about every possible terrain you will ever come across in a hill race and tests you at the point when your legs are already at their weakest state. After crossing the line I felt ill, exhausted and most of all like I never wanted to run again in my life. I also know that last bit wasn’t going to be true by the time the morning came around. 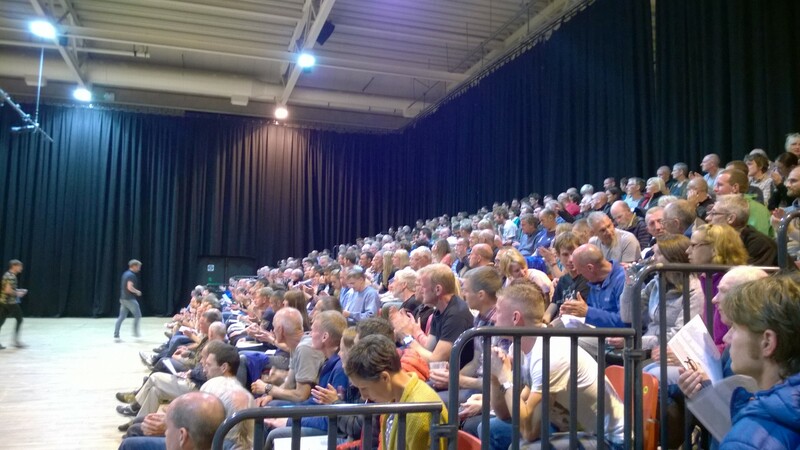 The race is a huge event in the hill running community and rightly so. It is the ultimate test of athleticism and deserves every bit of respect and reputation it has gained over the years. 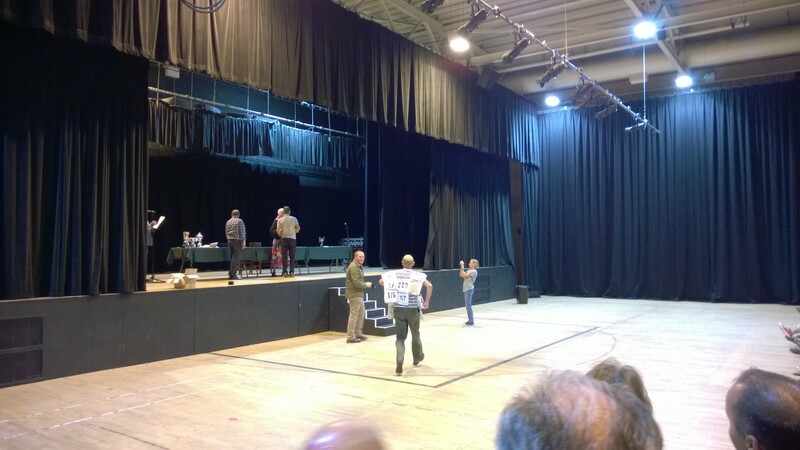 In the evening there is a prize giving ceremony which almost everyone attends, again as a mark of respect I think for how tough the race is and what it must take to win a prize in such a race. then afterwards, the crowds head into town and take over the local pubs into the early hours of the night. One of the awards is for those who have completed the race 21 times. I immediately recognised how much of an achievement it is to do this and they got the loudest cheer of the night too. 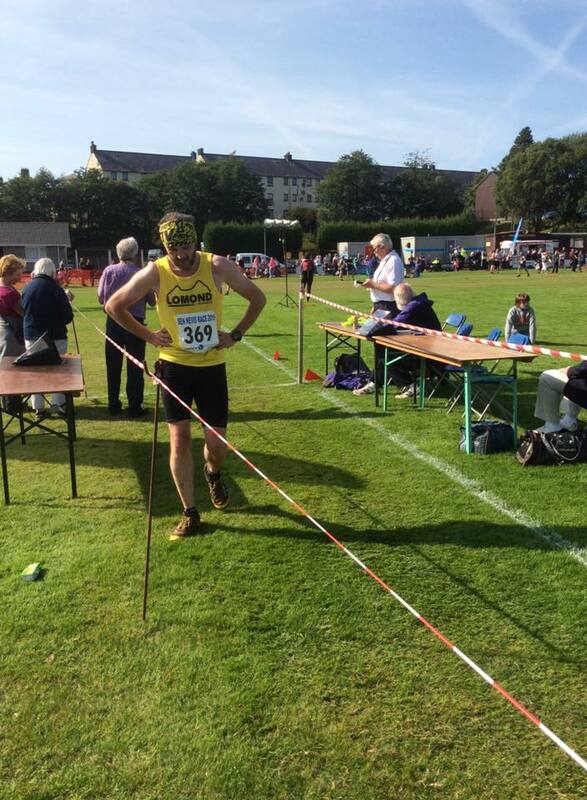 One of our Lomond Hill Runners completed his 21st race on Saturday and received his award. He had kept all his race numbers and made a jacket out of them all to wear as he went up on stage. He had his family there with him and for me it epitomised what this is all about. Recognising an incredible achievement, demonstrating the strength and resilience it takes to achieve it, celebrating it in a light hearted way, with your hill running friends and family. It rounded out a brilliant and unique day for me. Now, a few days later, my legs are still hurting, but the mental pain has gone. I felt like the race was my lowest point so far in my running. I felt like crap, didn’t feel prepared and felt like I’d not taken it seriously enough before the race. Hard lessons to learn on a race like this. I finished in 2h 35m and now want to go back and beat that time. It took me 1h 40m to go up and 55m to come down. If I want to do it again, I know I need to train harder and more specifically for this kind of race. It highlighted to me how little running I’ve really done and how little experience I have. It showed I can complete these races, but I want to be able to do it in a much stronger fashion and perform better. So, I’m certain that come December when entries open again, I’ll be posting my application off but I’ve got some work to do if I want to finish it better next year..